Radio flash trigger manufacturer PocketWizard has reintroduced its much-loved MultiMAX transceiver, having added more control options and improved handling. The MultiMAX ll offers a total of 52 channels, including 20 dedicated to ControlTL devices, as well as improved features for time-lapse and sequential triggering. The new version of the MultiMAX features a PowerControl function that allows the user to manually control the output of up to three groups of flashes compatible with the ControlTL system from the MultiMAX display panel. The screen is now illuminated by a blue LCD backlight, which the company says improves contrast and legibility, and the keypad is said to be brighter than that of the previous model. The system’s intervalometer has had the burst limit lifted so users can set it for any number of flashes for as long as they like, making the mode useful for timelapse photography, and the SpeedCycler mode is now equipped to perform sequential firing of up to sixteen cameras or flashguns in sequence. That last part is useful in fast moving situations, when you can’t wait for an individual flash to recharge, so the MultiMAX just fires the next one in line. The PocketWizard MultiMAX ll costs $230 and is available now. For more information, watch the video below or head over to the PocketWizard website. More timing features, same great reliability, all at a lower price. LPA Design, manufacturers of PocketWizard Photo Products, the global leader in reliable wireless control of cameras, flash lighting and light meters, announces the MultiMAX II and the return of unique timing features that only PocketWizard technology provides. Whether you are a sports, wildlife or wedding photographer, you will be happy to learn that the most powerfully-featured wireless radio on the planet, the PocketWizard MultiMAX, is back and fully compatible with all other PocketWizard radios. Building on the legendary MultiMAX, the MultiMAX II takes its place as the most versatile, reliable and predictably compatible radio on the market. For the past 16 years, the MultiMAX has helped capture amazing images, many of which have landed on magazine covers throughout the world. MultiMAX Transceivers continue to be found in frequency crowded environments triggering arena flashes or remote cameras behind soccer goals, hockey nets, basketball nets, horse jumps, bull chutes, and the finish line of major International Track and Field events. 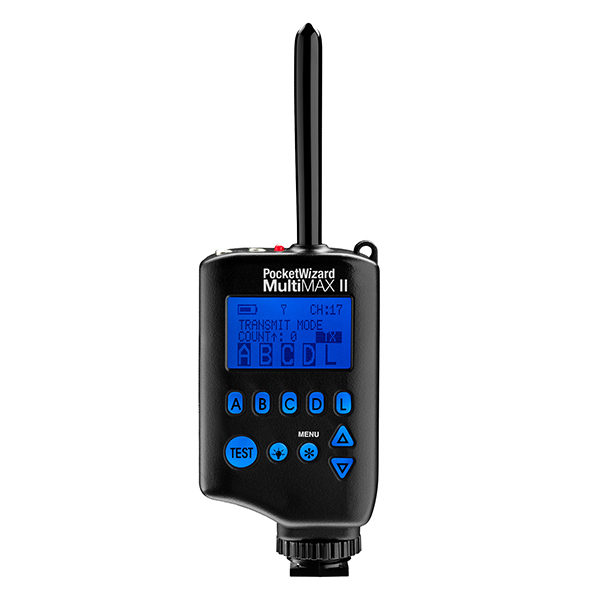 After a brief hiatus, the MultiMAX II returns with new features including 20 ControlTL channels, Manual Power Control and an improved blue backlit LCD which provides better contrast for improved viewing in dimly lit studios or on-site locations. The key pad is brighter too, allowing photographers to easily change settings on the fly. Its 344 MHz frequency sets it apart from 2.4 GHz noise in crowded venues. The MultiMAX II continues to provide incredible features that professional photographers have come to rely on. It has a whole suite of built-in tools designed for the demanding sports shooter like Patterns, programmable delays, and a settable contact time. The MultiMAX II is also Custom ID ready. Photographers can create incredible depth of field or stroboscopic effects with Multi-pop, give rear curtain sync to any camera, and even synchronize multiple cameras together, states Patrick Clow, Technical Support and Customer Service Manager. The MultiMAX II has a total of 52 channels: 32 Standard Channels and 20 ControlTL Channels. Photographers can creatively control groups of lights or cameras allowing them to work in crowded venues or with multiple flash set-ups. And now with Power Control, photographers can remotely adjust the manual power settings of ControlTL compatible radios and flashes in up to three zones with as many flashes in each group as you want. The MultiMAX II will be available at retail and on line in the US and Canada starting July 17, 2017. The retail price will be $229.00 USD in the US and $309.00 CAD in Canada. Previous PostUnderwater forest preserved since Ice AgeNext PostIs the U.S. ready for self-driving cars?